Prototype: 4 different design four-axle express train passenger cars painted and lettered for the Palatine Railroad. 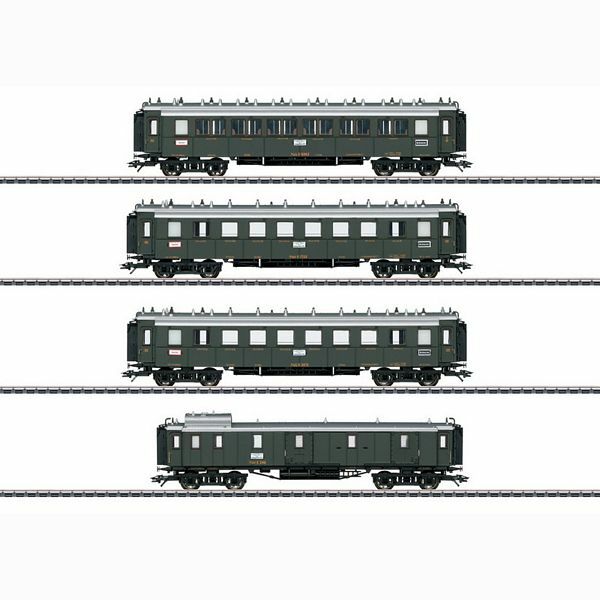 Of them 1 type ABCCü express train passenger car, 1st/2nd/3rd class. 2 type CCü express train passenger cars, 3rd class. 1 type PPü express train baggage car. The cars look as they did around 1910 to 1912. Model: The cars have detailed construction and are full-scale length. The minimum radius for operation is 360 mm / 14-3/16". All of the cars have older design buffers and spoked wheels. The cars model gas lighting with gas tanks and ventilation hoods for the gas lamps. There are ladders on the ends and on the underframes with truss rods. The trucks are a Bavarian design. There are sliding doors on the baggage car. The 66672 lighting kit can be installed in all of the cars. Total length over the buffers 86.1 cm / 33-7/8". DC wheel set per car E32301211.